The iPhone 8 and iPhone 8 Plus are more expensive for Apple to manufacture than the iPhone 7 and iPhone 7 Plus, according to component cost estimates research firm IHS Markit shared today with Bloomberg. An entry-level iPhone 8 with 64GB of storage costs Apple an estimated $247.51 in raw materials, an increase of almost $10 compared to the $237.94 it cost Apple to make last year's 32GB iPhone 7. The 64GB iPhone 8 Plus costs an estimated $288.08, up from $270.88 for the iPhone 7 Plus. To compensate for the increased cost, Apple charges $699 for the 64GB iPhone 8 in the United States, up from the $649 starting price it charged for the 32GB iPhone 7 in 2016. The iPhone 8 Plus is priced starting at $799, up from $769 in 2016. "The added value went to memory, camera, and processing. That's where we can materially identify where they've improved the overall product, and hence why they can command a higher price for it," according to Wayne Lam, an analyst at IHS. 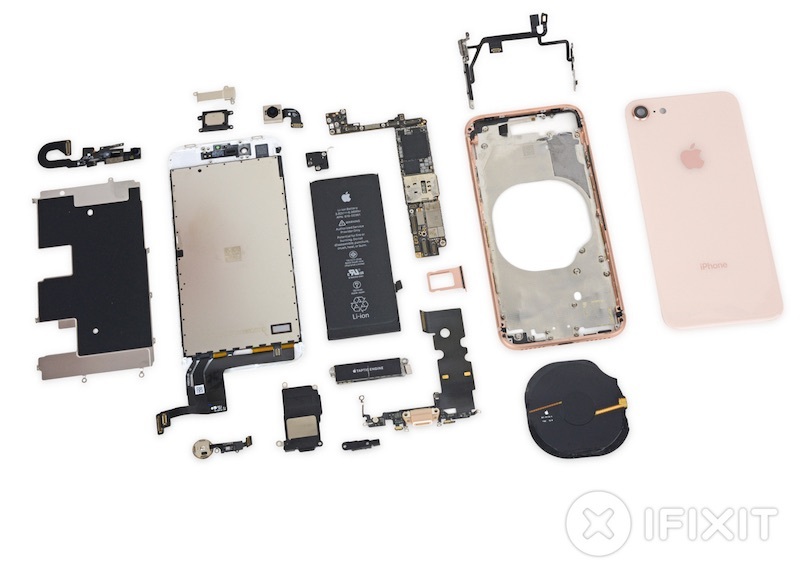 According to Bloomberg, some of the most expensive components in the iPhone 8 and 8 Plus include the screens and the mechanical enclosures. Apple's new glass-bodied devices are built around a strong internal frame and include new displays with True Tone support. Compared to iPhone 7 pricing, the wireless charging module increases costs by $2, the A11 Bionic chip costs $5 more, and the larger 256GB storage options increase prices by $6. IHS's component costs are only estimates of what the iPhone 8 and the iPhone 8 Plus cost to manufacture, and sometimes those estimates are not spot on. For example, while IHS told Bloomberg cost $237.94 to manufacture an iPhone 7 in 2016, its initial estimates following the iPhone 7's release were at $219.80. These estimates also only look at raw component costs and do not take into account other iPhone manufacturing expenses like research and development, software creation, advertising, and distribution, so this information, while interesting, is not an accurate measurement of Apple's profit margin for the iPhone 8 and the iPhone 8 Plus. Back in 2015, Apple CEO Tim Cook said that cost breakdowns are generally "much different than the reality." "I've never seen one that is anywhere close to being accurate," he added. Always interesting that 7$ to 10$ on their end equals 200$ - 250$ on the consumer end. These figures don't take into account R&D, Software, Assembly, Packaging, Shipping, Advertising, or Retail Store costs. Cost goes up $18 so Apple sticks it to their faithful for an extra $50. If Apple wasn't making record profits your point might be valid. Don't worry buddy, Apple are doing fine.. There is also the ever dropping cost of innovation. Since everything now is minor improvements the overall cost of research and development is dropping. Then there is the 4 year old design. The cost of this device should have dropped. These cost breakdowns seem completely pointless to me. They don't include the cost to develop the processor, for example, which is probably the largest cost to create the new phone. Second largest is probably the development and testing of the OS, which also isn't included. And then the cost for the part manufacturing assumes quantity discounts in the millions of units, so it isn't like you could just somehow buy the parts and build one for this price. Given that, I don't really see what this tells us. I guess the part manufacturing cost delta from last time? But, is that interesting to people? Not arguing - I'm honestly curious. I think this every time they publish one of these. I'm sure someone wants to see it, I'm just not sure why. Almost as interesting as the way people assume a $250 bill of materials somehow should produce free labor, development, marketing, retail read estate, and unpaid sales associates. Record profits by volume, but margins are about on par with history. No, they shouldn’t cut their margins as more people buy their products over time. Apple: Oh no! The profit is only almost twice the production cost! The horror!!!! huh? a huge chunk of the phone's cost goes towards labor/construction..
do that with this bill of materials of $247 and you come up with $741... Apple is selling it at $699..
is the cost high to the buyer? sure..
but Apple isn't overcharging here.. at least, not if comparing to how anybody else is running a profitable business. you really think Apple is profiting $500 per phone? and with a slick production / organized supply chain.. they may be able to pocket some more cash per phone.. but not because of greed so much.. more because they're smart builders. Ah, got to love that time of year when some geeks price up components and 'journalists' report it as news. It doesn't really matter if this number is $50 or $5000. There are so many moving parts in putting out a new phone and so many expenses, the individual component total cost is completely irrelevant, even if it were accurate.